Everything seems to be moving towards going digital – even making comics. But are you ready to make the jump? While the digital possibilities are vast and very tempting, I still see advantages in the oldschool method of drawing on paper. Here is a list of pros and cons as I see it. Since you’re drawing your art directly in the computer, there is less hassle scanning and cleaning up your original artwork. Being able to move and scale ANYTHING, including reference pictures, sketches and word balloons is definetely an upside. With a CINTIQ , you can even draw directly on the pressure sensitive screen (which also turns for maximum line control) and you have everything in one place. Am I the only one who sometimes find myself searching for the “undo” button, when I’m drawing on paper? Granted, the so called “lucky accidents” that come from working with a pen or a brush can be a pro as well, but more often than not, you end up with plain old UNlucky accidents – and correcting is a lot easier to do digitally (and with nicer result). It seems for some artists, the possibilities of going digital also offers more speed and momentum to their work. They are simply able to get to a nice result faster. Used efficiently, digital saves you a ton of time. In my experience, any task I take to the computer takes double the time. You can zoom in way too much and nitpick details. You’re working on a device that also has Facebook, Twitter and a gazillion other things running at the same time. I believe “PC” stands for “Procrastination Central”. And the speed of your work depends on the speed of your computer, your software, your file size and all sorts of other fun factors which you have little control over. You can work digitally with just a computer and a Wacom tablet. But if you really want to go all in, with all the advantages a Cintiq has to offer, get ready to throw almost two thousand dollars on the table. Ouch! You better be sure you can make that money back. Remember though, that equipment you use for your business is usually tax deductable (depending on where you live). When has a piece of paper ever asked for an update, or asked for you to plug in the power cord? The reliability on hardware and software is slightly scary (at least for me) because those things can go flaky on you with no warning. This is a big issue for me. I like being able to sit with a sketchbook or work out of the house for a day. If I had a digital setup, it would most likely be at my studio and too bulky to bring anywhere. However, Wacom has put out a 13.3″ Cintiq that is really lightweight and portable – But you still need to hook it up to a computer to work on it. A piece of Bristol board doesn’t suddenly crash on you and leave you to have to reconstruct hours of work. Unless you spill coffee all over your original art, it will usually outlive any computer. And if you scan it in, you have a digital backup as well, a lot safer than having just one file. Having drawn it all on the computer, you have no originals to sell at conventions or exhibit at your local library or whatever. Sure, you can make nice printouts, but that’s just not the same, is it? Note that this con could be a pro, since you don’t need storage space for your original art! You can put it all in your Dropbox or on a portable harddisk. Given the price, low mobility and given the fact that I don’t have the time for the learning curve that going all digital will require (at least before the result is anywhere near what I can produce with pen and paper), I don’t see myself going digital anyt time soon. And I don’t like having to rely on power and technology to be able to make comics. What do you guys think? Are there any pros or cons I missed? And what do YOU use to make comics? Comment below! Fun! I liked this article as I am currently banging my head against this very issue. Everywhere around me, the emphasis seems to be on digital but I just can’t spend that much time making tiny little adjustments. I can never do anything intuitive on the computer, I have to deliberately decide what steps I will take. When I am painting or drawing, my hand makes at least half the decisions. Taking my inspiration and then having to stop and decide how to make the computer do what I want takes me out of the moment. I know I have seen folks working digitally, and they must have that same relationship with the computer that I have with the pencil, but I’ve never gotten there. I barely have the patience to fix the brightness/contrast in Curves (and i groan and complain the whole time). pens, and paint. Though the price for scanning! I practically could have bought a big ‘ole flat bed scanner for the price i paid to scan my last project. 90 bucks for 36 pages…. Last thought – Given that I have a home computer with a functional amount of processing power, is there a stylus/pad that is good enough that won’t break my bank? You mentioned a Wacom tablet… I looked them up but got a bit overwhelmed. The Wacom I have is this one: http://www.amazon.com/Wacom-CTL460-Bamboo-Pen-Tablet/dp/B002OOWC3I/ which cost $249 but there’s apparently a newer version for $70: http://www.amazon.com/Wacom-Intuos-Small-Tablet-CTL480/dp/B00EN27TCI/ref=dp_ob_title_ce . Go figure. I think the trick is to get something small, rather than thinking bigger is better. A bigger tablet is actually harder on the hand! I use an all-in-one scanner/printer from Brother (model J6710DW). It’s a really great A3 scanner and so-so printer in one. It prints beautifully, but printing multiple pages it almost always screws up and prints a lot of blank pages and half on one and half on another page. I think it’s just eager to please and prints way too fast 🙂 I tried searching Amazon for this too and found on for around $350 but I’m not sure about US formats, so you might want to makes sure it scans in the size you need. Hope this is helpful, thanks for your insights! Now I gotta get back to my hand painted comics! I’ve been using drawing tablets for 14 years. Tablets in general: You are right, software hiccups, pen nibs, drawing surface getting worn out, getting used to drawing on the table while looking at the screen…I could go on. It is not for everybody. Small tablets: They totally suffice for the entire range of digital art! The only problem is psychological, because there are bigger tablets out there, and we live in a culture of “bigger is better”, so the curiosity will always be there to try out a bigger tablet. Medium tablets: I use an Intuos3 6x11inches, and I feel this is just right. It takes up a lot of desktop space though. But always remember — just because it’s 6×11, it doesn’t mean you use the whole tablet equally. I have a terribly worn out spot in the middle of my tablet, and it measures 4x5inches! Large tablets: I’ve never owned a large tablet, but I know I don’t need one because I don’t have the desk space, and I know that the extra drawing tablet area will not be used! 1. You’re too close to the monitor. This can’t be good for your eyes or health. 2. The surface gets hot. 3. Your hand gets in the way. Next time you get a chance, go to wherever has a Cintiq set up and try to push a tiny software UI button on a Cintiq. It is really difficult. Hey Stan, thanks for your insightful comments! You bring some interesting aspects to the table and sharing what tools you use is always valuable. Much appreciated! Hey Guys – Thanks for the tablet info. I can’t wait for tax returns this year, I think I might make a small investment! Pros of digital – Speed. Yes, especially for layout or pencils phases. With ability to in a short time make radical adjustments like horizontal flip, cut/paste, transform, or move the sketch around the panel without been forced to actually re-draw 90% of the existing drawing – the amount of saved time is huge. BUT, for me, that’s pretty much all. Few cons I noticed: Tiredness and fatigue. Both, the eyes, and the hand related, are at least doubled/by time; in comparison to analog technique. Example; after drawing digitally for 3 hours; I feel tired as if I’m doing it the classic way for all day, and night long. My fist hurts, my eyes get wet and red. (Some might say: “Well yes, but for that time spend doing it digitally, you’ll make more (or double) of the job as by drawing it traditionally”). Might be, but the question I’m intrigued by is; What will be a physical condition of my eyes and hand after, let’s say, 5 years of intense staring into monitor and using the tablet? (Like we all do not starring into monitors way to long already? Beside digital drawing). The complete lack of joy. By drawing digitally I haven’t experienced even a 1% of that “feeling good just by drawing” feel, we all craving for in the first place. It might be subjective for me, I don’t know. Plus the fact that I do not have that popular synchronization problem of having to look the way up into screen while my hand making movements down there on the pad. Not at all. But regardless, there is no relaxation moment as well. (I feel very, very relaxed just by filling large black areas with traditional ink). There are no emotions. I got no love for my digital art pieces. Like It’s made by some robot. Plus, after using some of those “fast digital corrections tricks” I felt “artistically” even worse. Almost like a cheater. …and it all comes down to the final calculation; whether is the love for drawing and that good feeling that it gives us (which is brought us here were we are now anyway) – worthy enough to be sacrificed for the speed (and the financial effectiveness it probably gains)? But bear this in mind; how good the art will be if it’s done without any love for making it? Can this emotionless type of art, turns out as rewarding for the artist in any aspect possible? Is that art at all? Scanning and final pre-press cleaning and lettering in PS. I hadn’t considered the screen fatigue you mention. Someone recently asked me if I wasn’t bothered by staring into the lightbox all day.. I haven’t noticed my eyes hurting, but my back and shoulders, sure. Oddly enough I can go longer on the computer, but that’s probably more to do with what I do on it – more mindless tasks like coloring and lettering. I think you’re absolutely right that enjoying the process is vital. Finding flow and getting in the zone where hours fly by and you forget to eat. As long as too many hours don’t fly by, you also need to arrive at some kind of result! There many alternatives out there for Cintiqs, I have both an Intous and a Yiynova MSP19 U which costs me $560 on Amazon. It is a great tablet that comes really close to a cintiq, and costs 4 times less. It has pressure sensitivity, no eraser or those quick buttons (I forget what they are called ) but it does have excellent pressure sensitivity … almost as good as a cintiq. I use to have the cintiq 12wx, and although I loved it, it was too small. When I bought the Yiynova I compared the 2, and I will say that the Cintiq is still superior, no question, but the 19″ screen compared to the 12″ screen was more relevant to me than the buttons on the cintiq and eraser on the stylus, which are 2 of the biggest differences. There is also NO LAG, which was another major factor. So I sold my Cintiq 12wx and kept the Yiynova MSP19U. I still have my intuos 3 in case something happens like the pen breaks or something. I too have not experienced the fatigue you mention Haris but everyone is different. Speed,Speed, Speed, – and speed is money. Did I mention speed is money? For me, I still think I draw slightly better traditionally, although I think Manga Studio Ex5, which I just started using recently, has narrowed the gap. If you are making comics digitally with photoshop you should at least give Manga Studio a try, you will not regret it. Thanks for the insight, Rommel! Good to get hands-on advice. BRIEFLY about me? Been at the professional art-making racket since 1993. Early on , I decided to NOT go into the academic tradition of FINE ARTS instead I went into COMMERCIAL ART. to University Fine Arts/ Art Gallery scene, then lastly coming full circle to Comic Books in 2009. I made the jump to digital in 2010/2011 , at present I’m working in BOTH mediums. I am leaning towards a digital workflow, or at best a hybrid method. that being, the ability to EDIT, and edit, and edit some more what you’ve produced. In some cases I have to just STOP, be satisfied with what I’ve composed and continue on to the next illustration/panel. isn’t all together a bad thing. iPhone or iPad loaded with social media apps can be JUST as alluring no? working at various Ad Studios & Production Houses to draw from to KNOW in advance what sort of technical pitfalls to avoid. If I can make a brief aside here, it boggles my mind how LITTLE comic book CREATORS know about the ACTUAL production process, meaning PRINTING, Wouldn’t it just behoove those who wish to publish their amazing stories IN PRINT to learn more about it? “The Pocket Pal, A Printers Guide” is a terrific , inexpensive, CRASH COURSE on learning about it all that I highly recommend! point about using the cost as a deductible on your taxes. should one be industrious enough to go seek it out, no? There’s no escaping the “mobility” issue you raise. off my little Wacom Intuos4 ! ! ! those who are thinking of getting into digital drawing. EVER printing in SMALL print runs of Limited Edition artworks/books, that are signed & numbered to boot! (much in the way Fine Printmakers do) to mediate that perceived gap between the two. artistically. Sure enough should the power go out, you could always draw-by-candlelight! where at the very least, the DIGITAL method could serve as a backup to your TRADITIONAL method of producing thought provoking stories. in order to achieve my artistic goals? it just seemed like the right choice to make. For me at least, I certainly don’t regret it, and look forward to sharing more art, digital or otherwise with you and the world in the future! Speaking of sharing, the concept of this site is … downright AWESOME. Thanks for the invite, so glad we met (virtually) online those many many moons ago. Hey Craig, some really good tips here and a very thorough point-by-point rundown of this post! A clarification (in case it was unclear): I’m NOT saying “don’t use a computer”! I am simply trying to explore the pros and cons of going ALL digital. I’ve obviously used Photoshop for coloring and effects, but I’ve never really drawn directly digitally – expect for recent years when I’ve been doing some iPad illustration/animation (which can be seen in the Comics for Beginners tutorial videos). Another distinction to make: Digital drawing (or coloring or whatever) on a tablet versus drawing on a Cintiq or another touch screen type gizmo. My experiences mainly come from tablets, so the coordination is an issue. Again, it’s probably a learning curve like you mention several times, but who has the time to sit down and learn a new tool that requires months of practice to get to the same level you already are with pencils and markers? Not me. I’m not bashing digital by any means. Some artists do amazing work completely digitally and hooray for them. If it works, great! I’m just pointing to the fact that a lot of artists go digital JUST to go digital. Seeing the gadgets and the gizmos as a way to escape the tedious work of actually learning how to draw and go straight to the fairytale land of cool highlights and funky effects. In my opinion, focusing on the fancy (and expensive) equipment is putting the cart before the horse. And I’ve seen people spend hours trying to create something in digital paint, that would have taken them ten minutes to do with a brush and a piece of paper. The computer is a tool, not a magic wand. Use it for whatever works to your advantage, don’t try to make it do everything. Again, thanks for sharing book and hardware tips! Very valuable I’m sure. I use an app called Sketch Club on my iPad and I draw pretty well on it. I read this and went through the pros and cons and I found some cons don’t apply. 1. Price. The app only costs about two or three dollars. 2. mobility. You can bring an iPad anywhere. 3. Time. In my experience, I can draw pretty fast on it. My finger is kinda like a pencil. So anyway, I’m thinking about which one to use…and I think I’ll do a comic on paper and a comic on the iPad and see which one is better for me. I was looking around for an alternative for Wacom and came across Bosto Kingtee. I found some good comments and comparisons on youtube and so finally I bought a Bosto Kingtee 22HD. You have to order in the internet here in Europe. The delivery from China was incredibly fast. The sending by DHL is included in the price. The Bosto was at my home 4 days after ordering. And I am really happy with it. 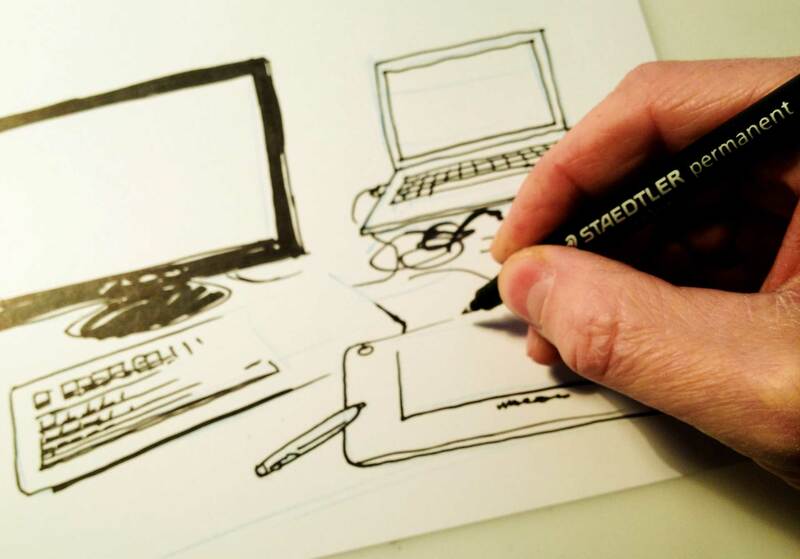 It`s a good alternative to Wacom. But of course for me there was a ethical issue also in my considerations. As the Chinese are just copying everything on the market and you don`t really know how the situation for the working people at Bosto in China really is… That mad me consider. Even though I ended up buying one. I am very happy with this product! Do you know something about the company? I don’t know the company you mention, but I’m sure Wacom employs Chinese workers as well. I do applaud you for considering the ethic aspects of purchase, but it’s really hard to navigate this area. Who knows where things are produced and under what circumstances? Brand trust is a tricky, fleeting thing. Thanks for the heads up though, I’m sure a cheaper alternative will be welcome by other readers here! Thanks for your input, Eric! I’m think the screen is not good for your eyes too. Mostly if you work 8 hours/day. You are so right, Lino. Missed that point. Lol, original. An ‘original’ is meaningless and arbitrary. I find nothing better than sitting on a sofa relaxing and drawing using nothing more than a cheap wireless enabled Wacom Bamboo tablet, a bluetooth keyboard and Photoshop on a 52″ 1080P HDtv. All you need is a computer with a HDMI output to do this – or even DVI would do. But this is vastly cheaper than using a Cintiq or very expensive large Mac & suitable monitor, probably a third of the price (I’d guess). In an ideal world of course this setup could be in a portrait orientation – but few TV mounts allow that, even if you can do it on your PC. I don’t mind as I usually zoom in and work on the top or bottom half of each page. I have also tried sketching on a Samsung Galaxy Note 10.1 which has a pressure sensitive stylus and Photoshop touch – but I really don’t like the gap between the nib and the image caused by the glass on its touchscreen, and as other people said – your hand does get in the way – which of course happens with real paper & pens! I find the simple texture of the Wacom Bamboo Pen & Touch A4 to give the right kind of “sketch” feel in terms of pressure for shading. Digital’s greatest strength is its undo feature, and the endless tweaking and zoom feature, which suits me, but you have to decide when to stop in terms of adding detail or adjusting! Its also nice to save different versions from time to time too. The biggest issue is piracy of course. Does this go on – surely its so easy to do a screengrab and compile a PDF – surely this is the greatest issue, unless you get your revenue with on-page or “in artwork” product placement! Lol. Has anyone tried that? what if i decided to do both? i could draw traditionally and make print outs on computer or even draw the book cover on computer. Im a young artist and i wonder could i do that? A combination of paper and computer is more or less necessary in this day and age. I just found that corrections and coloring (maybe even an effect here and there) works best for me. I know a lot of people who sketch by hand and do all inks on colors digitally. You just need to find your own way. As for right now,we can see bright future for digital drawing tech development for better supports in artwork tech.Well,if I had the opportunity and economically driven for fine art I don’t mind to invest for some really advance digital art tool..Which I guess it would be like high end wacom graphic tablet series(many of us artist wish for).But as it already clearly explained here,be sure to make profit with your lofty investment.If you are up too casual drawing I think it is better for you and me to make do with a set of drawing Drawing paper block/A3,drawing pencil & pen,watercolour,PC,basic stylus pen, and printer for now. BTW,This is a really good comparison on digital and tradional way of drawing.Which give me enlightenment ’bout some obvious pro and con of digital drawing I wondering…As I see some of great awefully beautiful artwork that been make digitally. Guess,it depend on one circumstances actually as for present time the cost for a good digital art tool would cost you hefty amount financially(except if you’re rich you wouldn’t mind about it). As the fully 100% digital art pieces worthiness,I agree it would be somewhat cheating and less valued if compare it to the harder to produced tradional pieces with equal quality were taken to considerations.BUT,I think this is an subjective matter to the art maker which differ if you look at it purpose-wise,as it just equal amount of effort invested on a different medium. As for me I would pretty much goes in flexsibel type of artistry skill.Which if I want to do some heavy drawing like comic,I would obviously go with tablet.And,if I want to draw advanced refined art like oil paint,I would still prefer the usual tradional way.Because essentially there is no way you would achieve oil painting art standard with digital tablet which in the end of tedious tweaking…you just still print it out…So it really depend I guess. Anyway,I sincerely thanks from the bottom-est of my heart for anyone who read this post through the end…;__;And I trully appreciate for Palle Schmidt for making this useful articles. I’m not sure I understand your question, Envoy. But since cost of printing is non-existing, people pay less for digital books. And that might also mean less for the creator. It all depends on the platform and the contract. Hey Micheal, I actually have been using a 22ux cintique for nearly 3 years with Adobe programs plus sketchbook pro, it is amazing however, I made a 50/50 switch back to traditional methods and I love the feeling of having something that’s a real material and not just pixels on a screen. I love technology but to have a hand drawn board carries the intimacy and integrity of an artist that can never be conveyed on a screen in my opinion. This was very helpful, i personaly love the undo button, but paper drawing has to be my fave. I can call the art my own, not the computer’s. Plus, you can go SHOPPING for funky art tools, hello, Hobby Lobby! I use both. I mainly use digital though and especially because I have a shake in my hand now due to medication digital helps alot with that, especially the stability function in manga studio. But I still do sketches and ideas on paper and still have a drawing board and lightbox in my studio if I feel like drawing on paper. Best of both worlds. Hey Ivan, that’s a really great trick. Thanks for sharing! Photoshop is now a monthly subscription, which makes it more accessible – but obviously pricy in the long run. There are also a ton apps for the iPad that I’ve seen pros do great work with. My iPad is old and the resolution is not really good enough for finished pieces, but if you have the later versions it should be quite sufficient for print. At least for single illustrations. Digital for comics, cool but very inconvenient in low power countries like nigeria. Still waiting for everlasting battery devices, till 2040 digital. I’m commenting on a three year old blog post haha, but I just wanted to say that the variety of ideas in the comments was just as interesting as the article! At first, I was in love with trying new brushes and spending lots of time on digital paintings (copying artists like Sakimichan, Ilya Kuvshinov, and Wang Ling). It was fun, and of course I never reached their expertise level, but one day I discovered what literally changed my art life forever: the hard square brush. The mix of opacity and transparency, the uniformity of the line weight, the way Photoshop’s brush engine builds up strokes . . .I’ve never found an equivalent like it in real life. The thing about it is, it forces me to stop focusing on perfection of lines and rendering. Because the brush is literally nothing but four hard corners, it’s impossible to blend something to perfection or spend hours upon hours over-rendering. All of a sudden it was no longer about pushing my computer to the cutting edge of digital techniques; it’s just about getting the idea out of my head and onto the screen. The hard edges of the Square brush cut out all my indecisiveness and reliance on the machine. Now when I draw, I feel like it’s more fun. Instead of a blank and unnaturally white screen, it’s more like a digital piece of paper. I can just throw my ideas up there and not worry about presentation or technique, I can just enjoy the Drawing itself. Of course I use other brushes as well, but I love the feeling of the Wacom pen in my hand now, and each brushstroke feels great. I don’t even think about the pen, tablet, screen, or software anymore. Of course, these are just my own experiences and opinions on drawing without paper 😀 I had fun reading everyone else’s too! It’s never too late to join the conversation, D’Angelo! I really like the way you describe how you came to your current working process, through hours of work each week. That’s what it’s all about! Figuring out what kind of tools work for you and how to get the most joy from the work itself. I have same experience with digital drawing but have mostly stuck to traditional simply because it’s what I’ve always done! However one of my friends recently got the Slate(https://www.iskn.co) and I can honestly say that I’m in love and looking to buy it soon! It’s the best mix of digital and traditional I’ve seen yet. This blog was an interesting read though and did make me consider many pros and cons so thanks! I know this is old but I had a problem, you see I been drawing traditionally for 5 years and more and bought a tablet few years ago and never used it because my digital stuff looked super bad, but now that I’m older I found that having all that paper is really bad because it takes up your life and it’s really hard and scary to move, even more so if your moving countries. The fear of having paper has left me paralyzed to draw. But digitally coloring is fast, all the colors are there and cheap because all you need is a tablet, which I know are super expensive but in the long run it’s so much cheaper!!! I also use a free program (Firealpaca) because my coloring style is pretty simple. The problem I have is that I love to draw, sketch and ink traditionally but I want to have at least amount of paper as possible, I been thinking about some ways to do this. Jason Brubaker, he does he’s comic by sketching the digitally and than inking that traditionally and scanning that and coloring it digitally, but he uses a cintiq would it be the same on a intuos? I’m scared that almost only drawing digitally will ruin my skill or stunt my growth. In the end you just got to figure out a method that works for you. a few years ago i finished my associates degree in theater but had to take an art class. he had us doing pencil and charcoal. he taught us stuff that transitioned well into what i do now; deviantart. However, i do understand that digitl=al art is the now and traditional art is the past and old and everyone hates it. as in my first deviatnart contest, the 25 semi-finalists were introduced and not one of them were ink and paper; all digital computer. What i do hate about digital is not the fact that i can’t do it, but i can’t do it. it is the fact that it doesn’t feel real and looks too good for your own good. when i draw with my pencil or charcoal, i get a little messy and i know how long and tough i’m struggling. but when i see the new stuff, people aren’t really touching it and getting their hands dirty, so it feels like even though they are working 10+ hours, it is not as satisfying because you aren’t touching it and getting dirty. so at the end, your messy hands and face will show how much you’ve worked on it. a tablet definitively has many advantages but I like the feeling of drawing on paper – being able to feel your pencil drag against a sheet of paper is very important.. I get psyched out to a certain degree because I dont feel the friction between the pen and the screen like I do on paper lowering my abilitie a little bit -enough to bug me. Some people stick a piece of paper over their tablet to get the friction you talk about. Haven’t tried it though. @ palle Schmidt I just desided to start making my own comic.i watched a few of your videos on youtube and they really help me get a better idea on how to set my comic up corectly. but was unable to find all of them.do you have the videos on your fb page ? and do you recomend any drawing books for a beginer lately i been just drawing images i save on my phone because i could not find any drawing books. Hey Josh, sorry for the late reply.